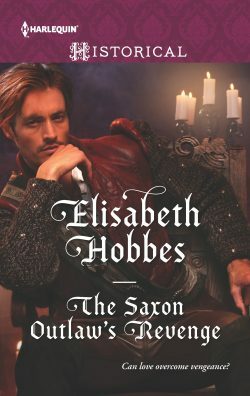 Today is the third week in our villain theme and today’s excerpt is from the The Saxon Outlaw’s Revenge by Elisabeth Hobbes. Robert leapt to his feet. People began muttering and jostling as a figure pushed through them. Someone screamed in alarm. Brunwulf swore. Robert barked orders rapidly and soldiers plunged in among the gathered watchers to find the source, roughly knocking people aside. Cries of indignation and alarm filled the air until eventually two soldiers returned dragging a struggling figure dressed in a dark blue cloak. The soldiers marched to the dais and threw their captive to the ground in front of Robert. One dropped a short sword alongside him. The other ripped the cloak from him and threw it aside, revealing a scrawny figure dressed in a worn tunic and hose with leg bindings where a sheathed dagger was stuffed. He pulled the dagger loose and threw it alongside the sword. Good excerpt and lovely book cover.